Most climbers use a mechanical system (fig. 8-1) as their principal rappelling method, and all operate essentially the same. The two strands of rope are run through a rappel device attached to your harness. As you begin the rappel and gravity pulls you downward, the rope slides through the device. Your braking hand controls this natural pull by adjusting the amount of friction on the rope as it runs through the device. It does this through a combination of variations in grip and hand position. With some setups, you get additional friction by wrapping the rope partly around your back. You control the speed of descent, and you can come to a stop anytime you wish. It takes less effort to produce friction at the top of a rappel than at the bottom, because the weight of the rope hanging below you puts added friction on the rappel device. This is especially so on very steep or overhanging rappels where most of the rope hangs free. But no matter how little grip strength may be required to control your descent, your braking hand must never leave the rope. Your other hand—the guiding, or uphill, hand—slides freely along the rope to help maintain balance. To rappel with a mechanical system, you need to wear a seat harness, or an improvised diaper sling or figure-8 rappel seat. Never rappel with a simple loop of webbing tied around your waist, because it can constrict your diaphragm enough to make you lose consciousness. Fig. 8-2. Diaper sling ment—just carabiners. All climbers should know how to use the carabiner brake method, even if they normally use a specialized rappel device. It's a great backup if the device is lost or forgotten, and it's the safest method of rappelling without a special device. To create the carabiner brake setup, start by attaching one locking or two regular carabiners to your seat harness. Any time a regular carabiner could be subjected to a twisting or side load, two carabiners or a locking carabiner arc needed, and this is one of those cases. If you use two regular carabiners, position the gates to keep them from being forced open and accidentally unclipping (fig. 8-4). The correct position is with the gates on opposing sides, forming an X when they are opened at the same time. The diaper sling (fig. 8-2) takes about 10 feet of webbing tied into a large loop. With the loop behind your back, pull an end around to your stomach from each side. Bring a piece of the webbing from behind your back, between your legs, and up to your stomach to meet the other two parts. Clip them together in front with doubled carabiners or a locking carabiner. The diaper may also be clipped to a waist loop. The figurc-8 seat (fig. 8-3) is improvised from a standard-length runner. It must be clipped to a waist loop for stability. After attaching the harness carabiners (or locking carabiner), clip another pair of carabiners to that, in the same correct position. Then face the anchor, if you can. Lift a loop of the rappel ropes through the outer carabiner pair. Take yet another carabiner and clip it across the outer carabiner pair, beneath the rope loop. The rope then runs across an outer edge of this final carabiner, known as the braking carabiner. One braking carabiner (fig. 8-5a) provides enough friction for most rappels on ropes that are 10 or 11 millimeters in diameter. You might need a second or even a third braking carabiner (fig. 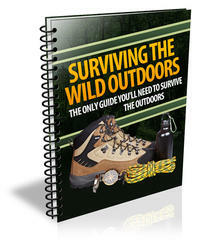 8-5b) for thinner ropes, heavy climbers or heavy packs, or steep or overhanging rappels. The ropes must always run over the solid side of the braking carabiners, never across the gate. There are a couple of things to watch for as you're setting up the carabiner brake system. First, it's sometimes not possible to face the anchor as you pull the loop of rappel rope into the carabiner brake, and this can get confusing. A common beginner's mistake is to pull the rope into the system backward, as if preparing to rappel uphill toward the anchor. Second, the weight of the rope hanging down the cliff may make it very difficult to pull the loop of rope up through the outer pair of carabiners and hold it while you clip in the braking carabiner. It helps to get that weight off the system. You can do that before pulling the loop of rope through by yanking up some slack rope and throwing a couple of wraps around a leg to take the weight. Or you can do it by pulling the loop through first, but making it extra large so you can lay it over your shoulder while you clip in the braking carabiner. Then drop the downhill strands back through the system so the brake remains close to the anchor. Fig. 8-5. 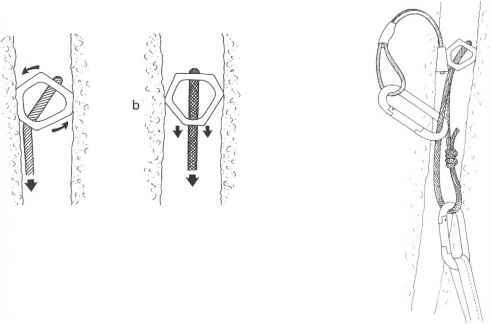 Carabiner brake system: a, with one carabiner clipped across the outer carabiner pair; b, with two carabiners clipped across the outer carabiner pair in order to give greater friction. If you are near the edge while setting up the carabiner brake or any other rappel method, you should be attached to an anchor for safety. When your brake hands must never leave the rope rappel? How to make climbing rappel system? 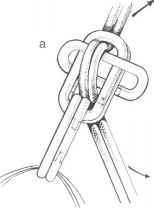 How to make a carabiner?